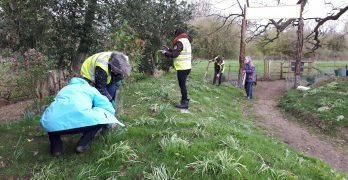 The 16 volunteers had to be watchful as we moved around the site, as the pathways were dangerously slippery from the recent heavy rain. 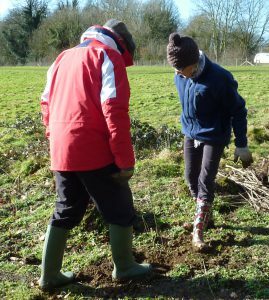 But, despite days of cold and rain, we had a beautifully clear and bright day to start the process of bedding in bare-rooted trees, and a few specimen potted plants too. These needed to be planted in advance of the Big Plant-up scheduled for April 2018. 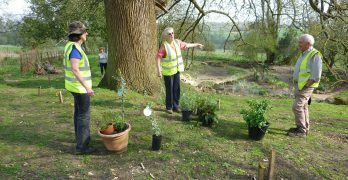 Please go to Danesbury Fernery Planting Record to see a list of the 100x trees and shrubs, and a few perennials, which the volunteers planted on 15th February 2018 under the direction of Sarah Marsh, our Garden Designer. The prime purpose of many of the bare-rooted trees planted is to restore the shelter which the more delicate ferns and other specimen plants would have enjoyed in the past. An equally important purpose is to screen the site from unwelcome Motorway views, (not a Victorian problem), whilst also presenting seasonal blocks of colour and interest which will frame the many other vistas to be enjoyed from within the Fernery. A great deal of planning is underway to ensure that the mechanical digger will be able to operate on site in the two weeks commencing 9th April without impeding the designated Big April plant-up. 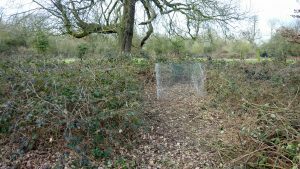 Mike was able to cut his way through the brambles and with Andrew was able to build a second mulching cage which will gradually be brought into commission. 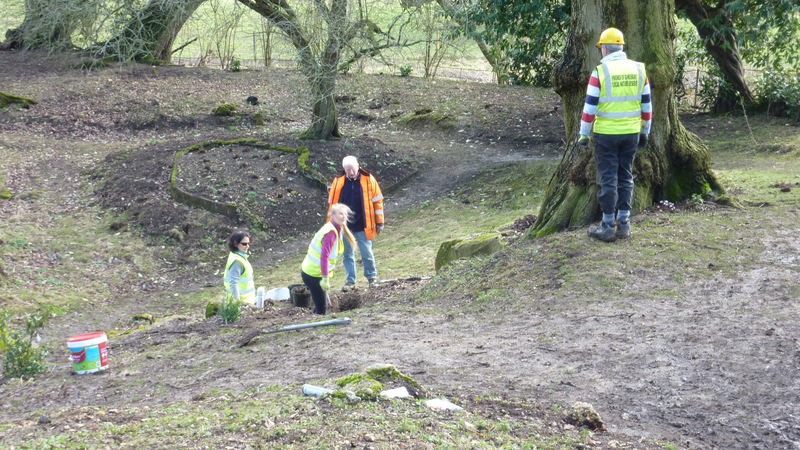 Mike also managed to excavate more brick ‘foundations’ at the North end of the dell, which throw up even more unanswered questions. Are they in fact foundations of some sort, or perhaps elaborately shaped planting beds? 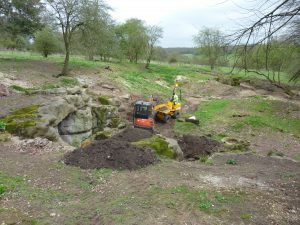 In April when we have the mechanical digger on site, we will carefully remove some of the spoil above that area to see if we can come up with the answers. 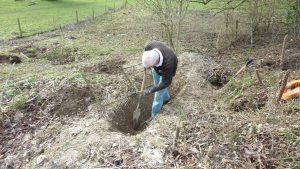 Stephen continued the very hard and slow task of digging out old wrought-iron fencing panels from the lower side of the site, where they have lain unseen for many years, under several feet of chalk and spoil. We are gradually moving these original panels to fill gaps in the fencing on the top side of the site where they are in full view of visitors. In the fullness of time, we will plan to replace the fencing on the lower side with replicas. 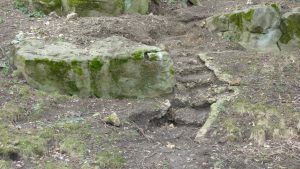 Ann and Becca continued their exploration of the steps on the South side of the dell. As with the discoveries at the North end of the site, every piece of excavation throws up more questions about the direction these steps are taking. Last but by no means least, Harry got a temporary watering hose into action for the first time from our new mains supply in the shed. He and Tony watered many of the new plants, and next week it is hoped that our new self winding reel and 40 m hose will be installed, ready to be tested over the entire site. We will report on that separately, as we will need to organise a watering roster of volunteers. We were very pleased to welcome four new team members: Jane Thom, Mike Smith, Sylvia Cook, and Richard Tucker – not forgetting Sara who joined us last month. We have been accepted as one of the Open Gardens within the 2018 Welwyn Festival Open Gardens Programme. We have made impressive excavation progress on the site since our Open Gardens introduction in 2017, and we can now add considerably to the overall interest value by proudly talking about, and showing, the emerging Victorian Garden. This is the 1st Sunday of the Welwyn Festival – i.e. the day after the ‘Street Market’,traditionally the Festival opening event. We will have more news, and plans to publish over the next two months, and must expect that June will come around very quickly! (Please go to our Calendar for details of all meetings). 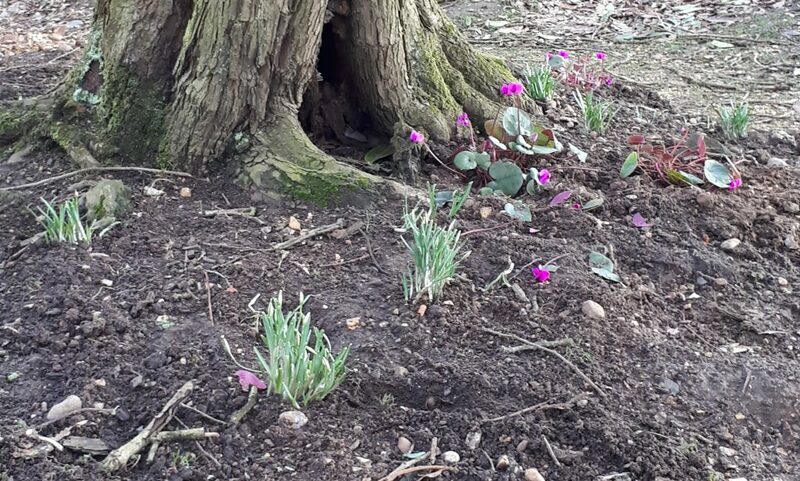 Saturday 3rd March 10 a.m.
Cyclamen enjoying late January sunshine in the shelter of the trees – the snowdrops not yet showing. 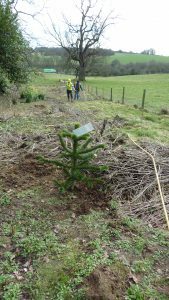 It is important that all volunteers understand that because some 600 trees and plants will be purchased for planting in April 2018, then this fact alone will inevitably shape our work priorities over next few months. 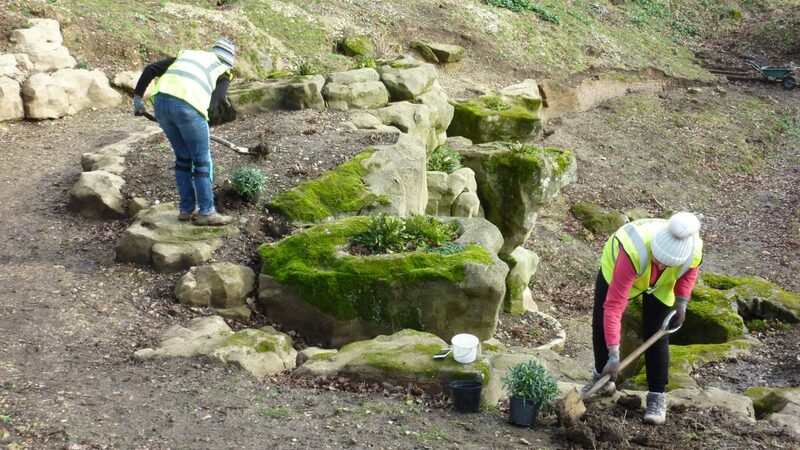 Although we will press on with excavation of rockwork wherever and whenever we can, that work is not time-related, and tasking priority will therefore be given to getting the 600 plants bedded in safely. 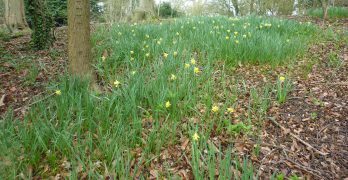 For 2 weeks commencing Monday 9th April, the Council will make a mechanical digger, and Maydencroft resources, exclusively available to us a) to remove unwanted spoil and b) to help (if the volunteers need help) with the big April plant-up. On Friday 9th February Sarah, our garden designer, with Ann MacDonald (WHBC) are meeting up at Rochfords Wholesale Nursery to purchase some bare-rooted trees. This is the time of year to buy them as they are considerably cheaper than when potted up by the nursery for later sale. These plants will be placed in their final planting positions, in advance of the 15th February work party, ready to be heeled in. The plants might need a drink, so Andrew and Harry are working to select and install a shed-based hose reel in time. Task 2a – If we have time to prepare the materials needed, we want to open a second storage area to gather leaves, matching the first one that Andrew built. 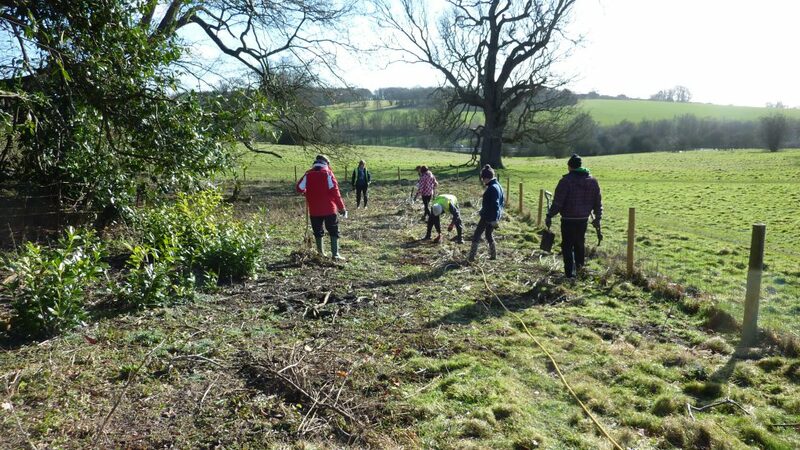 We therefore plan to cut into the brambles just to the North of the existing storage cage and build a second one. We have loppers to help clear the area. 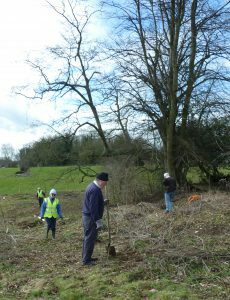 Task 2b -The first leaf cage can start to be emptied and used – once errant sticks have been removed. Task 2c – We are hoping for a delivery of mulch from the Borough Council in time for the big plant-up and we will have to agree where it should be stored ready for use. If it is not too wet then we must have another go at lifting more autumn leaves from the paths and loading them into the Mulching Cage. We need to keep a close watch on nettles which are threatening to get going once again. But the nettle roots cannot be put into the mulching cages, and must be stored in our wildlife area. 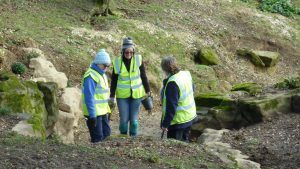 TASK 5 – Ongoing – Removal of tufa rock from the Central area. It is a certainty that before Maydencroft’s mechanical help arrives in April 2018, we will need to start to clear the central area where the tufa rocks have previously been dumped. This central area will play a principal part of the Garden Design and the site will need to be prepared and mulched, ready for planting, before the date of the big April plant-up. We have to agree a schedule with the Council, which identifies those areas that we want included for mechanical soil removal. Mechanical excavation is likely to include pathways in the dell that were only half excavated in 2017; the spoil heap at the North end by the Pulhamite outcrop that is currently hiding the secrets of the brick foundations in that area; the pathway at the top of the slope which looks to be covering more brickwork and possibly steps too; possibly excavate the slope beneath the red-brick retaining wall to see what it hides; and remove soils that remain within the gorge and to the side of the dropping well. 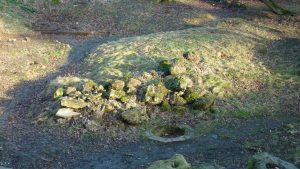 Another area that might be considered is the Southwards extension of the top path above the grotto, and the planting bed above that, which we believe hides one of Anthony Parson’s Victorian drainage tanks. We will also ask for the basin to be cleared of the rocks dropped in by vandals. We are in the process of agreeing badgework projects for boys and girls of the 1st Welwyn Scout Group – of whom Andy Trotter, (one of our team members), is Group Scout Leader. 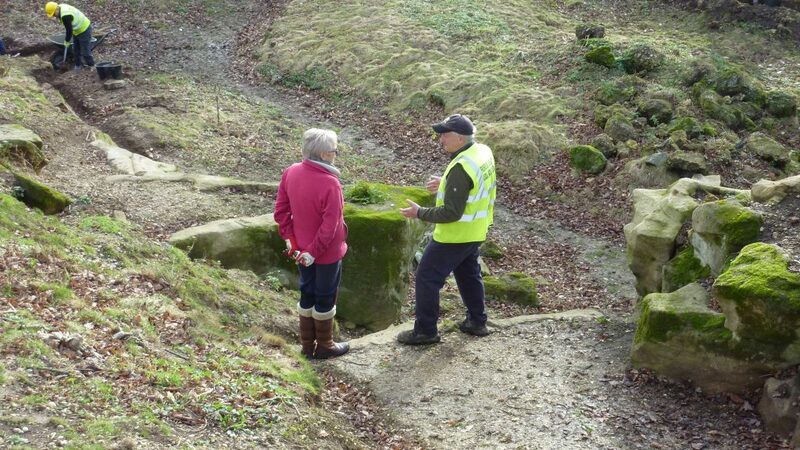 They will range from a rudimentary Survey/Drawing of the Fernery Site, to the construction and erection of bird boxes. 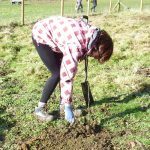 The purpose is to stimulate young peoples’ interest and involvement in the countryside, and perhaps help them value this Victorian gem on their doorstep. Scout Leaders will be present at all times to provide the necessary supervision, but the support of FOD volunteers will be greatly appreciated. When these Projects are agreed, they will be detailed on the website. Dr Kris Lockyear, Author, and Senior Lecturer in Archaeology at UCL, (and President of the Welwyn Archaeological Society) has special interests in field work and geophysics. He hopes to be able to make an assessment for us in April/May time. Website Changes – a new Garden Restoration tab. We have created a new Garden Restoration tab just for recording all gardening and planting aspects of our work. The Garden Restoration section includes details of Sarah’s appointment as our Garden Designer, together with her 1st draft Planting List which has already been agreed with the Borough Council. We will be posting ‘Garden’ News items as we proceed. 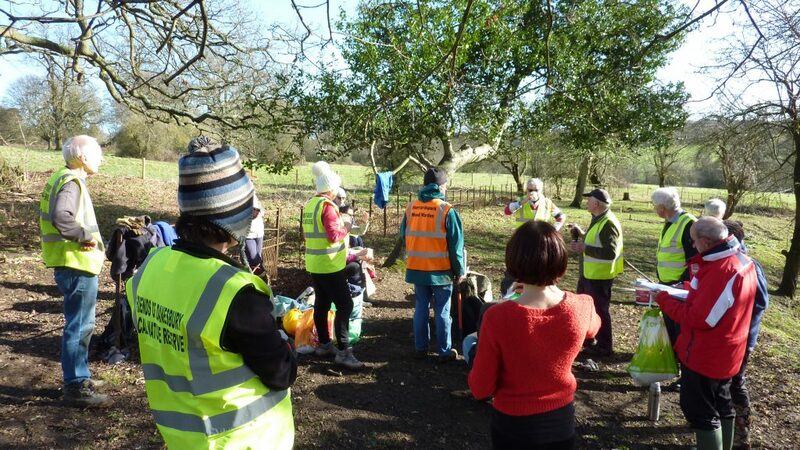 We will meet at 10 am at The Fernery on Thursday 15th February 2018. The leaders will expect to be on site from 9.30 onwards to get the tools ready, so if you are an ‘early bird’ and can help, please do so. We are expecting to welcome one or two new team members. All team members should have good quality garden gloves and wear strong boots, and bring a hot drink for elevenses. We will provide small hand tools for general use. For newcomers, the Fernery can be found at the top end of North Ride on the Danesbury Estate, AL6 9RD. For more details please go to ‘Where We Are‘ tab at the top of the page. Your Committee is moving closer towards recommending that we ‘open’ the Fernery once again in 2018 as part of the Welwyn Festival Open Gardens Programme. 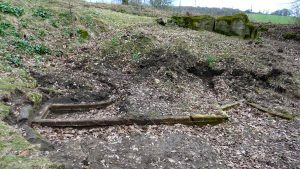 Since our brilliant introduction on June 18th 2017 we have made further startling discoveries of rockwork and brickwork, and for the first time we will be able to show visitors the shape of our new Fernery Garden. But this will only be possible if we are able once again to call upon the fabulous support we received last year from the Friends, in organising and running our Refreshments Marquee and providing other support functions. We are delighted to announce that Sarah Marsh has volunteered to be our Fernery Garden Designer. Sarah has received a brief from the Borough Council on those areas of the Fernery garden which should initially be developed and improved. These will be the beds associated with the dropping well, the bed under the hawthorn tree and the smaller bed below the lime. Sarah will now work to produce the planting design for these beds, and draw up a list of the plants she would like to include. We will buy stock direct from WHBC’s main supplier for those plants, but Sarah will be free to source any of her choices that are not carried as stock items – and we might presume that this would include specialist growers. Based on this exhilarating Management step, the WHBC have reiterated their intention to fund the purchase of the plants that are needed, ready for planting in April and May 2018.